KiCAD schematic has been updated as per the previous post. Did some clearancing for the heatsink tonight. One more piece to cut/bend and i can look at fixing it down. Same goes for caps and bridges. It mostly sits where I want it now, so pretty soon I'll know how the boards need to look too. OK, heatsink is in place, though not bolted down, yet. Boards should be wide, not long. up to 100mm wide, up to 50mm from heatsink to edge, smaller in either dimension == even better. But not at expense of crappy routing/placement. Heatsink clearanced for tape deck mock parts, and mounted using three well aimed screws. The whole thing is stiffer as a result (ties back plastic to front steel). Next up, power supply stuff, or maybe the TODO. I'll check that now and then edit this post. Will glue it in once it's wired up, and/or recess the clips so that they work. It's such a nice tight (hand cut!) fit, though, it barely needs it. Only cap mounting and power distribution buses to go! viewtopic.php?f=37&t=1966&p=30972#p30972 Then it's down to the PCBs and IO wiring and fascia looks etc. 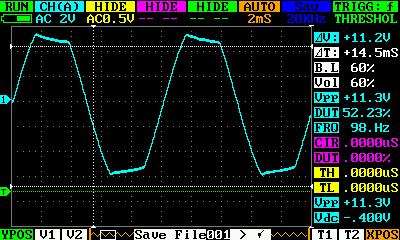 Notice how the lower frequency signal has a much higher peak to peak? That's because it has a recovery time in between and gets recharged. 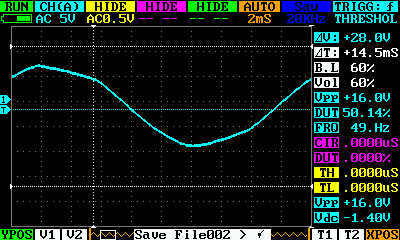 You can watch the single-ended rail voltage sag during louder sections of music. Tomorrow I'll add 22000uF to the 2200uF that's in there, and retest with the scope. I bet it's louder, and possibly a bit clearer too.